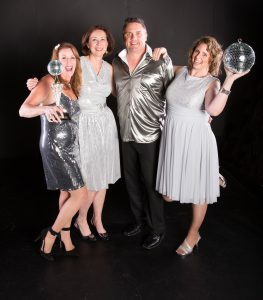 August 5, 2016 – Ten Nevada County couples will compete for glory and the coveted mirror ball trophy at The Center for the Arts’ 4th annual Dancing With Our Stars fundraiser at Veterans Memorial Auditorium on Saturday, August 20. Nevada County celebrities will swing, hop and boogie to raise money for The Center for the Arts in the fourth annual Dancing With Our Stars competition. Whatever their favorite dance style may be – ten regional celebrity dancers have accepted the challenge to train with a professional dancer and compete in front of a live audience and a distinguished panel of judges for the Dancing With Our Stars champion title. Each star contestant has committed to raise at least $2,000 to benefit The Center for the Arts. The teams include local stars paired with pros who will compete Saturday, August 20 at Veterans Memorial Auditorium in Grass Valley. 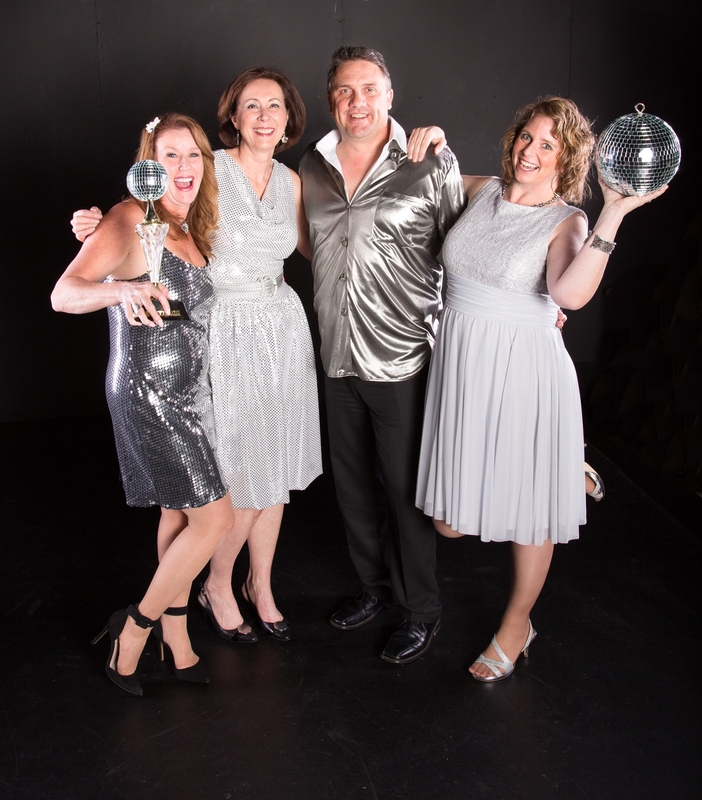 These dancers are raising funds and competing to win one of three mirror ball trophies. Attendees receive a full afternoon and evening of activities and entertainment. From 4:00 to 6:00 pm ticket holders can stop by Stucki Jewelers in downtown Grass Valley for their “Sparkling Baubles Pre-Show Social.” Stucki will clean and polish attendees jewelry for free during the event. At 6:00 pm attendees are encouraged to dress up and walk the red carpet and join fans for a photo opportunity with the Dancing With Our Stars trophy. Appearances will be made by alumni dancers & stars, emcees and judges. The bar will be open and snacks available while stars arrive and walk the red carpet half hour before doors open. Doors open at 7:00 pm for the main event. There are three ways to win. First the top fundraising couple, second to audience’s favorite dance team based on votes the night of, and finally the title of 2016 Dance Champions is awarded to the Judges Choice. Supporters are encouraged to come early to place votes for their favorite dancers. For online donations dancers Razoo pages can be found at: https://www.razoo.com/team/4th-Annual-Dancing-With-Our-Stars/share. Following the show attendees can join dancers, volunteers and staff for an after-party at The Center for the Arts Off Center Stage. The 2016 Dancing With Our Stars fundraiser is sponsored by Ostrofe Financial, Stucki Jewelers, Cornerstone Bookkeeping and Kim Sayre Photography. Lorraine Gervais, a singer with a lifetime of performing with a unique and soulful style all her own, Lorraine Gervais started singing at public events when she was 5. In the role of concert producer and mentor, Lorraine Gervais Productions has showcased regional artists and vocalists who live in Northern California. She has been a judge for every DWOS so far! Tresa Honaker, Director of Air Aligned aerial dance troupe. She is one of a handful of artists selected to live at Warehouse Artist Lofts in Sacramento and recently spoke at TEDx Sacramento finishing her talk performing on aerial net high above The Community Center Theater. A veteran judge returning for her 4th year. Matt Ritchie, an award winning swing dancer and instructor who directs the dance group Kickin’ & Swingin’. Barry Friedman, a 4-time World Juggling Champion and half of the world famous Raspinyi Brothers. He recently published ‘I Love Me More Than Sugar: The Why and How of 30 Days Sugar Free’. Barry has appeared on over 200 national television shows and regularly performs his act at corporate events around the world. He also was a Dancing with Our Stars champion in 2014 with pro partner Marni Marshall and has the coveted mirror ball trophy proudly displayed in his home. Julie Baker, Center for the Arts Executive Director. Julie brings over 25 years of experience in arts marketing and management to her current position as Executive Director of The Center for the Arts. Earlier in her career she worked in New York City at several prominent art galleries and the international auction house Christie’s before becoming the President of her family’s art marketing agency. After selling the business in 1998 and moving to Nevada City, she worked as an Executive Producer for Tristream, a web development firm. In 2001 she opened her own business, Julie Baker Fine Art and for 2 years co-produced and founded an art fair in Miami. She currently serves on the board of California Arts Advocates and Californians for the Arts. Julie can’t dance but loves to boogie. Meet 2016 Dancing with our Stars celebrity Rita Stevens! Rita would have to say she is a news junkie at heart. After College at San Jose State she started working in newsrooms in the Bay Area and stayed there for 18 years, working in radio and on TV. After that it was a move to Nevada County, but she still couldn’t stay out of the news business and went to work at KNCO Newstalk 830 in the newsroom. So how did she end up Dancing With Our Stars? That is a good question. She doesn’t remember applying per se but her morning co-host Tom Fitzsimmons is probably the reason she was selected. Every morning he would tell the world on the radio “Rita ought to be on Dancing With Our Stars. I think she’d be great at it! So here she is, a non-dancer, paired with a magician (Nick Federoff) who dances on the side, both of us trying to learn the moves to put on a great performance and hopefully not do anything embarrassing. That said, it has been a lot of fun and she is really looking forward to the performance. And if they can pull it off, maybe there will be a little Magic worked in. Meet 2016 Dancing with our Stars celebrity Ryan Witt. Ryan attended NUHS where he graduated with fellow dancer, Jason Fouyer. He went on to attend U.C. Santa Cruz where he played for the 1995 NCAA National Champion Banana Slug tennis team. Post-graduation, he coached collegiate tennis in Idaho, New York, and southern California. He then joined Best Sanitizers, Inc., a local company started by his dad, where he now works as Vice President of Sales & Marketing. He is married to local attorney Jamie Hogenson and they have two boys; ages 10 (Julian) and 12 (Jackson). Ryan loves coaching many of his boys’ sports teams. As a family, they enjoy the outdoor activities that Nevada County has to offer and feel extremely fortunate to be able to live here. Ryan is thrilled to be one of this year’s dancers because he loves the Center for the Arts and appreciates what the Center does for our community. He is a frequent attendee of shows at the Center where many of his favorite musicians love to play. Music is greatly valued by his family, as all four take lessons. Learning some sweet dance moves during this process is an added benefit and he hopes to be able to take those moves to new dance floors with Jamie for years to come. He is so thankful to have Natina Pistone as his pro dance partner. Teaching Ryan to dance is something nobody should have to volunteer to do!!! Meet 2016 Dancing with our Stars celebrity John Sievert! John Seivert, PT, DPT, OCS, FAAOMPT, CSCS, PMA-CPT graduated from Northern Arizona University in 1984 and then went on to complete several postgraduate programs in PT. He has been teaching Manual Therapy courses to physicians and other medical professionals around the nation and world. He is a co-owner and inventor of the Myotool (www.myotool.com). This self-treatment tool allows one to mobilize their own spinal joints, as well as perform many other soft tissue treatment techniques. The Myotool has been on the market since 2005 and has seen steady growth in use. As a resident of Grass Valley and business owner for 16 years his private practice, Body Logic Physical Therapy (www.bodylogicphysicaltherapy.com), has grown from one Physical Therapist on staff to seven Physical Therapists and two Physical Therapy Assistants. He enjoys leisure time salsa dancing with his wife and professional dance partner, Roxanna Cohen, spending time outdoors working in the garden, camping and training and racing his many bikes (road, mountain and cyclocross). He also enjoys riding bikes and hanging out with his kids Alec and Jessica. As members of the center for the arts, Roxanna and John ave enjoyed frequenting many shows due to the stellar line-ups. This was the very reason he decided to dance in this years DWOS competition. He is so happy to be a part of the fundraising efforts for an organization he loves so much. Thank you for giving him the “chance to Dance”. Meet 2016 Dancing with our Stars celebrity Hayley Pritchard! Hayley Pritchard was born in the Bay Area and is so thankful her parents moved to Nevada County to raise her in this rustic community! She is now a senior at Nevada Union High School and plans to attend Portland State University in the Fall in pursuant of a degree in Health Education and Business. She has taken music lessons for the past seven years, and loves to perform! She spends her time volunteering with NEO and other organizations in the community, Interning at The Center for the Arts, playing guitar, writing music, drinking a lot of coffee, traveling, and acting in the Nevada Union Theatrical Society. Hayley lives in Nevada City with her two awesome parents, Jim and Kathy, along with her big sister Allyson and their fur baby, Rylee. She is so excited to be participating in Dancing with Our Stars as the youngest contestant EVER! Hayley and her pro partner Logan Hays are ready to bring it and win it! Meet 2016 Dancing with our Stars celebrity Kimberly Pruett! Kim moved to Nevada County in 1998 with her family. After moving to Nevada County, Kimberly co-owned Rising Stars Gymnastics and taught gymnastics for many years. Kim has served as a Senior Field Representative to Congressman Tom McClintock for the past seven and a half years covering 10 counties. Kin is very active in local charities and has served on and helped with many local events. Kim will be dancing with her professional partner Jeremy AcMoody on August 20th. Meet 2016 Dancing with our Stars celebrity Shanin Ybarrondo! Shanin is dancing with professional, Tzoul Shine on August 20, 2016. With over 30 years in marketing, it has been my pleasure to help various businesses and non-profits promote their product, service or event to the right audience. In 1999, as a single mother, I started, Anything’s Printable. My greatest joy is listening to an individual or group share their passion and commitment they bring to their lives, businesses and community. In, 2000, I created Wild Women on Wine, a non-profit organization. With a business partner and a special group of women, we created a national membership with chapters in various states, shipped product worldwide and produced the Fall Fandango, the most incredible wine tasting event. Both Wild Women on Wine and Anything’s Printable succumbed to the economic crash of 2008. However, out of that great loss, I attended Sierra College and obtained a business degree, that same year I completed our local Barbara Schmidt Millar triathlon. I continued to work in the wine industry with Zinfandel Advocates and Producers, to produce the largest single varietal tasting in the world held in San Francisco until 2012 when I accepted a position at SNMH Foundation as their Event Coordinator and moved into the Development Director position. Most recently with the support of my amazing husband of ten years, I returned to my roots and launched my own marketing company, Immersion Marketing. I’m blessed with a tremendous support system. I enjoy playing softball, hiking, kayaking, and spending time with friends and family. I believe in the power of humanity and the magic of compassion for others. My motto is “leap and the net will appear”. I strive to find joy in every moment of every day and hope to inspire and assist people along the way. Meet 2016 Dancing with our Stars celebrity Dr. John Lace! Dr. Lace was born and raised near Pittsburgh, PA. He is a third generation physician and has been in Grass Valley since 1999. He has been the Medical Director of Critical Care and Respiratory Care at Sierra Nevada Memorial Hospital for more than a decade, and has a solo physician’s office in Grass Valley. He is also a jazz musician on piano and string bass, and performs locally on occasion. Dr. Lace is proud to attend the musical performances of his son, Simon Lace, who is a junior at Nevada Union High School. Dr. Lace is an avid naturalist, and participates in the annual Audubon Society Birdathon, a spring fundraiser for the Sierra Foothills Audubon Society. He lives in Grass Valley, with his beloved, Jennifer Wilkerson. Dr. Lace will be dancing with professional Maria DiCintio on August 20th. Meet Dancing With Our Stars 2016 celebrity Jason Fouyer. Jason is a principle and Chief Operations Officer of Cranmer Engineering Inc. Working with engineers and chemists, has primed him well for his launch on to the dancing scene. Nothing says free spirited dance like chemistry and engineering. He was elected to the Grass Valley City Council in 2010, reelected in 2014, and appointed Mayor. This political experience has added tremendous amount of boogie down knowledge to his resume. Previous to his election he was Chair of the Planning Commission and was seated on the Parks and Recreation Commission. Currently Jason sits on the Nevada County Transportation Commission, and is on the Board of the EDBG/ Business Advisory Board. He has years of experience of “dancing” around the issues. Jason is a graduate of San Francisco State University with a BA in Fine Arts, Certified Land Use and Environmental Planner through UC Davis Extension, and the owner of two left feet. As an art major he understands the importance the Center for the Arts has upon our community and to show it, he is putting his best foot forward in the dance competition. Jason is married to his wife Tamara and together they are raising their children Liliana (10) and Austin (7). When he is not dancing he enjoys time fishing, camping, and time with his family. His kids have requested him “to learn a dance that won’t embarrass them”. Jason will be dancing with professional Stacy Maliszewski on August 20. Meet Dancing with our Stars 2016 celebrity Joyce Schwilke! Joyce is an Enrolled Agent and Accredited Tax Advisor. She is a seasonal workaholic who travels vicariously via the postcards clients send her from around the world. When she does travel, it often includes an out-of-town concert. [A former beau said her concert habit was his deal breaker.] She transplanted herself from Long Beach in 1988 and found serenity in our small town life. This year marks Foothill Tax Service’s 25th year in business. A hiking accident required two surgeries which interrupted her love of partner dance. Now, back on the dance floor, Joyce is excited to help promote three things she’s very passionate about: live music, dancing, and tax deductions! Joyce is partnered with dance professional Cosmo Merryweather. Meet Dancing With Our Stars 2016 celebrity Pete Vasilakos! Pete Vasilakos of Big Oak is 77-year-old Nevada County resident. Pete, a U.S. Army combat veteran from 1962-64 in Thailand and Cambodia, and who served stateside for four years after that, is on both the honor guard and the color guard for the Legion’s Frank Galliino Post #130 in Grass Valley. He agreed to participate in Dancing with our Stars only if Jamie Hogan would be his professional partner. Likewise, Hogan, who has competed in the event twice before, said Vasilakos was her only ticket for a third round. Raised in a Greek household in Menlo Park, and a Nevada County resident since 1999, Vasilakos inherited a love of dance from his mother, a dancer and a singer.